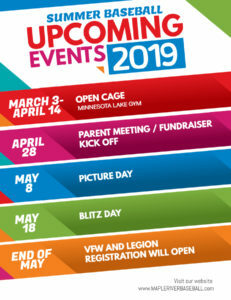 Registration is now closed for Maple River Summer Baseball (VFW and Legion registration will open at the end of May). If you are still interested, please contact a board member to assist you! The Maple River Baseball Association is a non-profit organization serving the communities of Amboy, Good Thunder, Mapleton, and Minnesota Lake.